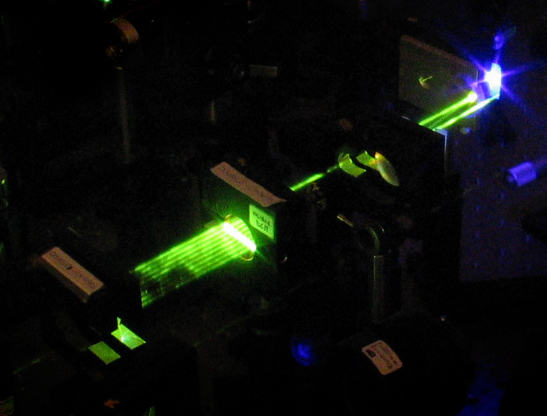 The laser source available in the laboratory starts from a Ti:sapphire oscillator followed by the Chirped Pulse Amplification (CPA) technique; it delivers light pulses centered at 800 nm wavelength with 1 kHz repetition rate, energy of 1 mJ and 100 fs duration. CPA consists of three subsequent stages: first the temporal duration of the pulses generated by the oscillator is stretched by a factor of 10³ by means of a stretcher, to avoid damaging of the device because of high peak power; the pulse energy is then boosted by a Ti:sapphire regenerative amplifier system and finally travel through a grating-based compressor capable of compensating the dispersion between different colors, taking back their time duration towards the transform limit. The light provided by these laser source is then manipulated by linear and nonlinear optical processes, aiming at broadening the spectral width, tuning the center wavelength, shaping the pulse temporal profile, mainly for spectroscopic applications. One of the main tools for the generation of tunable light pulses starting from the standard 100-fs Ti:sapphire source is the Optical Parametric Amplifier, which is able to deliver ultrabroadband pulses in the visible and infrared spectral range, from 500 nm (2.5 eV) to 2 micron (0.6 eV). Coupling this stage with second-harmonic, sum-frequency and difference-frequency generation systems, tunability can be extended to 250 nm wavelength (5 eV) in the ultraviolet and 3 microns (0.4 eV) in the infrared. Pulse compression stages, based on chirped dielectric mirrors, deformable mirrors and spatial light modulators in 4-f configurations, allow shaping the pulse down to the transform-limit duration (sub-10 fs). In pump-probe experiments an high energy beam, the pump, resonant with an electronic or vibrational transition excites the system to be tested and afterwards a low energy beam, the probe, traces the changes photoinduced by the former; the temporal evolution of the system is monitored scanning the delay between the two pulses. 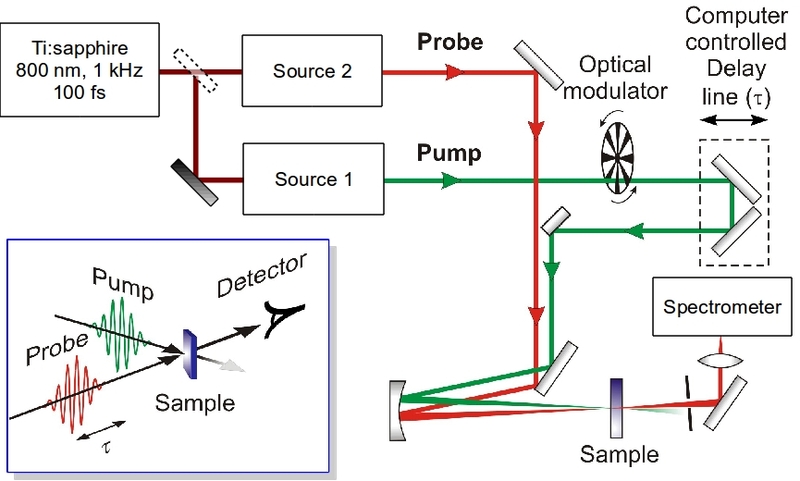 The temporal resolution of such experiments depends on the time duration of the pump and the spectral resolution of the probe detection; it is thus essential to produce very short pump pulses and broadband probes in order to investigate ultrafast dynamics. Pump-probe can trace dynamics of organic samples (molecules, oligomers and polymers) as well as inorganic ones. Depending on the properties of the system, it is possible to set up different experimental configurations. In our lab the pump-probe set-up is coupled to ultraviolet, visible and infrared broadband sources, allowing to pump and probe at different wavelengths and to detect ultrafast dynamics with unique temporal resolution.